This route follows some very quiet rural roads with superb views of the Aiguilles de Popolasca, Lac Cacalcuccia and one of the islands most picturesque mountains, Paglia Orba (2,525m) and the Cinque Frati granite towers. It's centre piece however is the Scala di Santa Regina, 'the stairway of the Holy Queen'. It is said, 'if Corsica is the work of God then the scala is the work of the devil'. The great thing about this route, vistas apart, is you get to ride the Scala twice - assuming of course you can outrun the devil!! I start at the junction of the D18 and N193 just a couple of kms south of Ponte Leccia. The D18 is a very quiet rural road that meanders its way up to Popolasca which is by passed on the way out. The impressive rock backdrop is the Monte Cinto massif more of which later. After 10km you will arrive at the Col Croce (664m). It's an unusual spot given that you are in the middle of nowhere and at a confluence of six roads with seven sets of road signs! You need to continue on the D18 signed for Corte (as there are two D18 signs) and descend to where it joins what is possibly my favourite road on the island, the D84. 16km of gradual climbing (average gradient 3%) now into and out of the Scala di Santa Regina which follows the twists and turns of the Golo river. The farther you go, the narrower the gorge becomes as the walls rise up over 300m above you. There are some great photo opportunities especially where the road ahead blends into and almost becomes invisible in the granite cliffs. After the Scala you will come to Calacuccia, its lake and the dam. There are spots here to replenish. Carry on and through Albertacce until you arrive at the two stone bridges just before the turn onto the D218. If it's warm, then either side of the bridges you will find some great natural pools to swim in. The D218 takes you back to the D84 via north shore of the lake. 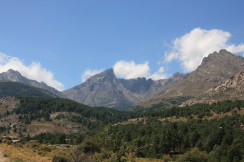 From this road there are fantastic views of Paglia Orba with it's fin like shape and the Cinque Frati (five brothers) granite towers of Monte Albanu. Alternatively there is also a road along the south shore which takes you over the dam and gives you a lake foreground photo opportunity. Back onto the D84 and the Scala again but descending this time to the D18 where you retrace your route via the Col Croce. Just one diversion into the tiny village of Popolasca to take pictures of the Aiguilles de Popolasca which provides a stunning backdrop to the village. It's a short and very sharp climb but well worth the effort and easier from the side you descend to rejoin the D18 back to where you started at the junction with the T20 (N193).